We're in the home stretch at 125 Midway and hustling to finish construction within the next couple weeks. At this point it's all about finishes: railings at the main entry, landscaping, paint colors, details in the lobby, cabinetry and tile within the units, and much more. About 75% of the units are already leased, but there are a couple great apartments still available. We're hosting an open house this weekend from 11am-2pm on both Saturday and Sunday. Join us to see the fully complete and furnished model unit. The model includes a variety of finishes, including standard and upgrade options. The realtors will be on hand to discuss leasing options and unit availability and to answer any questions. The model unit at 125 Midway is now complete and we gotta say it looks pretty good. The model unit features a mix of standard finishes and upgrade options. Take a look below and you'll see some of the tile options, paint colors, and light fixtures that are available. Better yet, come out to the Open House this Saturday and Sunday from 11am-2pm. It's the best way to get a feel for the space and the level of finish. We're still taking reservations for condos and the sooner you reserve the more customization options you'll have available. We've reached another major milestone at 125 Midway and have started to hang drywall. As an architect and builder this is an exciting moment - after looking at the exposed framing everyday for the last few months, all of the sudden the rooms are transformed and we can start to really imagine inhabiting the spaces. Changes will come rapidly now as we begin to finalize and install all the various finishes, including flooring, baseboard and door casing, doors, cabinets, etc. We have a number of units still available and if you reserve now you'll have more flexibility in selecting the finishes for your unit. Please call Scott if you have any questions or want to start reserving a unit. 401-868-4212. Drywall begins in Unit 303. The framing at 125 Midway is complete and the building is essentially "dried-in" - all the windows are installed, the sliding glass doors are in place, the roof membrane is down, and, with few exceptions, the building paper is on. This is always a great moment in a project when you can walk through a fully framed building and finally "see" the spaces that have until now only existed on paper. So, what's the verdict? We're incredibly pleased with the results so far: the unit layouts are working very nicely, the proportions feel right, and some of the last minute changes have clearly paid off. There are a couple things that we've had to reconsider, but it wouldn't be a construction project without a couple of revisions. Check out the photos below! With the framing complete, our focus shifts to the building interior where all the trades are hurriedly installing electrical wiring, plumbing, mechanical systems, and fire sprinklers. Before long, we'll be hanging drywall and starting to complete units. I'll be posting more in the coming weeks about interior finish and finish options. We're currently accepting reservations for condominiums and the earlier you reserve the more flexibility you'll have in selecting interior finishes. If you have any questions, please contact Scott Veloso at 401-368-4486. Check out the aerial photos of the construction progress at 125 Midway. We're currently signing pre-purchase agreements for one, two, and three bedroom condos. More information here. 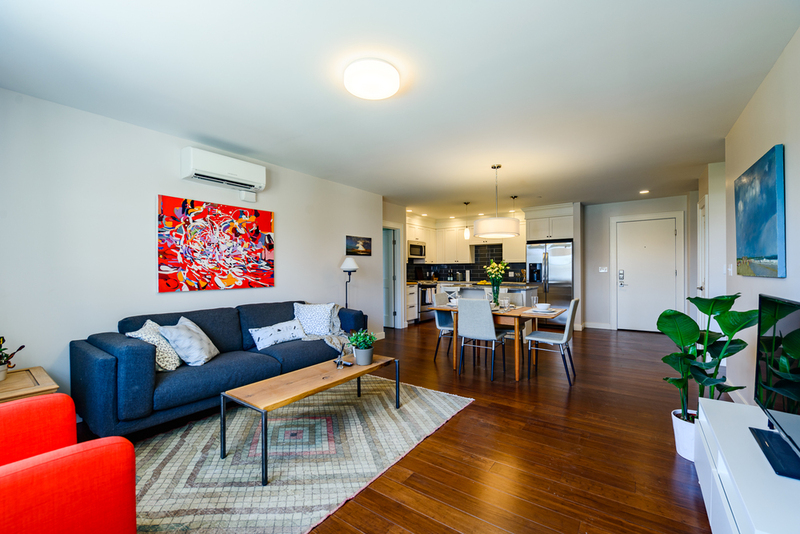 We're hosting an open house this weekend to show off a recently completed unit at 45 Pop Lofts. You'll get a sneak peak of the finished apartment and we'll be on hand to answer any questions about the building and leasing options. We're also be able to share floor plans and answer any questions about the new building that will start going up this Spring. There's snow stopping us. Despite the inclement weather, work continues unabated at the school building. We finished up all rough construction in January, passed inspections, and have moved onto the interior finishes. This means trim is being installed, doors hung, walls painted, cabinetry installed, tile surrounds are going up and hardwood floors are going down. The building has rapidly gone from looking like a construction sight to looking like habitable apartments. Well, so long as you squint your eyes. Take a look at the photos below and check back for more updates. We are currently signing pre-leases and units are getting claimed quickly. If you're interested in an apartment at 45 Pop Lofts, please don't hesitate to call. Did I mention that you won't have to do any shoveling? Kitchen cabinets in Unit 102. Kitchen cabinets, Refrigerator nook, and pantry in Unit 102. Tile surround and tile floors in Unit 101 bathroom. Despite the weather, work is not slowing down at 45 Pop Lofts & 125 Midway. We've crossed a number of milestones in the past couple weeks. At the school building, we've passed rough inspections and begun insulating the roof and exterior walls. In most of the exterior walls, particularly in the former window openings, we have nearly 12" of insulation with an R-value of approximately R-40. That's twice as much insulation as required by code for new buildings! Be assured that despite the building's age it's going to be warm in the winter and cool in the summer. For all you energy geeks out there (and I know there might be a couple), for this project we've chosen to use an open-cell spray foam insulation for the walls. Spray foam sometimes gets a bad rap for being more carbon-intensive than cellulose and other natural insulation materials. However, spray-foam is in a league of it's own when it comes to air-sealing and reducing air-infiltration in buildings, a factor which is critical in an old building like this. Moreover, the school building is a masonry building which has a very different moisture profile than a traditional wood-framed house; you need an insulating material that can accommodate some moisture movement, but that is not susceptible to mold. Hence the spray foam. In this case, we have chosen to use an open-cell spray foam which has a significantly lower carbon footprint than closed-cell spray foam and a proven track record for performance. We also firmly believe that when thinking about sustainability, we need to consider the full life-cycle of a building. So if a particular product has a higher up-front carbon footprint, but allows us to build a more durable building that will last longer than the alternatives, then that's a no-brainer for us. And if that wasn't enough, we've begun the excavation and concrete form work for the new building at 125 Midway. The rain and inclement weather has slowed things down a bit, but we're on track to start pouring concrete footings this week and begin forming the walls before the holidays. New awning and stonework at front entrance (and permeable asphalt in the parking lot!). Insulation hoses going into the units. Nice warm walls with almost 12" of insulation. What a difference an day, err a week or two, makes! The windows are in, the new siding is going up, and we've crossed a major milestone on our way towards new, habitable homes at 45 Poplar. As highlighted in the previous blog post, the window composition is a major component of the new look of the old school building and we couldn't be happier with the result: the quality of the windows is excellent, the composition and the relationship between brick, windows, and siding looks great, and there's lots of light within the units themselves. Take a look at the photos below and make sure you take a slow drive by the next time you're in the neighborhood. Installing the first window. Way to go Dave! New windows, new siding, and old brick. Beautiful shadow lines at the corrugated metal siding. Complete with the new siding. New window openings along the facade. The original windows at the school. If you've been by the school building recently, you've no doubt noticed a few changes on the exterior. One of the most noticeable - and one that we're particularly excited about - is the framing of the new windows openings within the old windows. If you remember the former school, all the classrooms featured huge, nearly wall-to-wall windows. Now this was great for a classroom, but it's too much glazing for a comfortable home. Not only would it be expensive to heat/cool, but it's important to have some privacy in your home. So to solve this we are removing all the old windows, adding new framing within the existing openings, and then adding new, tall windows selectively within that framing. The openings will now alternate between opaque panels of metal siding and new tall windows. The windows are organized on a consistent grid, but the arrangements shift so that each apartment has a slightly different configuration. Not only does this make for unique unit layouts, but it activates the facade so that the static rhythm of the old openings is broken up by the shifting pattern of the new windows. Take a look at the photos and you'll see what I mean. Windows are scheduled to be delivered and installed later this month. The construction at 45 Poplar is moving full speed ahead. With the exception of a few isolated spots, the demolition is complete. And while we uncovered a few unexpected things (it wouldn't be a true construction project without a few wild cards, right? ), fortunately nothing has left us scratching our heads for too long. One of the benefits of working "design-build" as a team of builders and architects is that we have the capacity to be very agile and make adjustments on the fly. As we've begun to frame out the typical 1-bedroom units, we've been able to see where the walls are, spend time in the space, and then tweak things in response. We've had multiple coordination meetings with the sub-contractors to discuss and revise the heating/cooling strategies and adjust the lighting to better fit the space. And while this process can make the day-to-day a bit hectic, there's no question we end up with better buildings and spaces as a result. Here are a few progress photos. Looking from the front door towards the bedroom. Continued demolition in the "Boiler Room", which will be a unique double-height apartment unit. Design-build in action: developer, designer, and builder all rolled into one (or two). Well, at least demolition has begun. If you live in the neighborhood, then you've probably noticed a lot of activity around the school building. In the past couple weeks, we've mobilized the construction crews, completed the full asbestos abatement, removed old equipment, and begun removing old finishes and walls in preparations for the new apartments. In the next couple weeks, we're going to complete a unit mock-up so that we can run through the whole construction process. I'll be posting regularly with construction photos and more information about particular features of the building. The Providence Journal just ran an article about our project on North Main Street. As you can read in the article, this project is proof of concept for the double-stud wall construction that we will be using in the new building at 125 Midway. It was a great opportunity for us to experiment with the construction details and work out some kinks in the construction sequence. I'll try to post more specifics in the future, but suffice it to say that we've been really impressed with the results so far and are excited to take it to another level at Garden City. Many thanks to Alex Kuffner of the Providence Journal for his interest in the project and great article! The North Main Street project features a commercial storefront space on the first level and three two-story townhouses above. If North Main Street is more your style and you're interested in either the commercial space or a townhouse, please let us know and we can provide more information. The spaces will be available this fall.